Absco double garages can be used for a variety of purposes, as a workshop, to garage your car or boat or as an entertainment area. 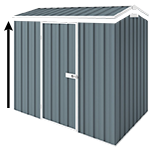 This Double Garage Shed is a high-quality Australian made building, manufactured from Australian made BlueScope Steel. The all-steel structure also means it is strong, versatile, weatherproof and easy to maintain. Our double garage sheds can be used for a variety of purposes, as a workshop, to store small vehicles, a boat or as an entertainment area.